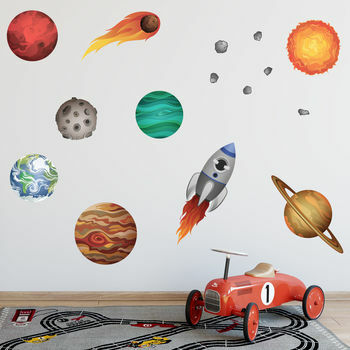 This children's solar system wall sticker set brings outer space right into any bedroom or play area. It's perfect for boys bedrooms. The pack includes a rocket and sun as well as planets that resemble Earth, Mars, Venus, Saturn and Uranus. Earth's moon and a few asteroids are also included. Fitting is extremely simple as all you need to do is peel and stick each piece in place. This fabric wall sticker set can be applied to any smooth surface including painted walls, glass, mirrors and furniture. The wall stickers are available in small, medium and large sizes. This solar system wall stickers pack is made from an innovative polyester fabric that is both removable and repositionable. The material will not leave any residue behind on the wall and is virtually impossible to rip. The stickers are printed with high quality, long-lasting inks and the material has a very slight fabric texture. All you need to do to fit them is peel and stick. Small pack: The sheet size measures 56cm x 76cm. The rocket is 40cm x 14cm, Saturn is 34cm a 16cm, the sun is 19cm x 19cm and the smallest asteroid is 3cm x 3cm. Medium pack: The sheet size measures 114cm x 76cm. The rocket is 60cm x 20cm, Saturn is 50cm x 25cm, the sun is 28cm x 28cm and the smallest asteroid is 4.5cm x 4.5cm. Large pack: The sheet size measures 250cm x 76cm. The rocket is 88cm x 30cm, Saturn is 74cm a 36cm, the sun is 42cm x 42cm and the smallest asteroid is 6.5cm x 6.5cm.